Scott Brinker has another must-read post. I excerpt parts of his post below so I can expand on it a bit but you should read his full post along with the comments. “Marketing technology is not just about efficiency — it’s about experiences. The relationship between strategy and technology is circular, not linear. That is a pretty strong recommendation for option A in Scott’s illustration below. The fact that the relationship between technology and strategy is circular – that they have to inform, influence, and advance with each other – is true of all enterprise applications and for all functions and has always been true. Technology is not just a set of product features. The features are possible because of creative combinations of underlying software concepts, programming languages, data structures, and architectures. Without some understanding of the underlying fundamentals it is natural to think product features define software capabilities and thus to limit insight into strategy possibilities. Marketers (or other professionals) with little to no technical background can compare feature sets and build strategies that match, or build strategies and look for the set of already existing product features to match. Each of these illustrate what we might call the bad kind of circularity (as we mean when we call an argument circular) and they handicap innovation. The good kind of circularity is a strategy/technology dialog of what ifs, informed by what might be possible, not by what is already known. It is both natural and common for consultants to overemphasize option A, because way too often option B is overemphasized at the expense of option A by both their customers and technology vendors. Good consultants spend a lot of time and effort helping customers overcome an under-appreciation or political deprecation of the importance of strategy. But all of us need to be careful not to suggest either linear false choice. While not everybody agrees that web content management should be the hub of digital experience management implementations, there should be no doubt it is an essential core component. Certainly the WebCM / CustomerXM / DigitalXM, etc. vendors that started in web content management have an opinion, though there are many nuances in their positioning which are important to understand. Even more interesting is what they have all learned in the past few years while incorporating or integrating other technologies to help their customers build modern digital experiences for customers and employees. Vendor visions and expertise are at least as important as those of analysts, consultants, integrators, agencies, and even your peers. 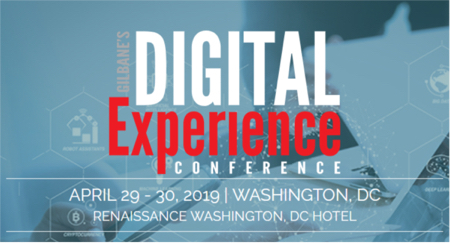 Wednesday, December, 4: 2:00 p.m. – 3:20 p.m.
You probably need to attend every session in the conference to even learn all the questions to ask before embarking on a next generation digital experience strategy and design. In this session a panel of competing vendors will discuss what they see as the critical components and challenges based on their customer’s experiences and feedback, and on their own vision of what is possible. Vendors have lots of valuable experience and information and this is your chance to hear from knowledgeable representatives minus the PowerPoint pitch.